AFRINIC Research and Innovation Lab supports AFRINIC's role as a Network Information Centre (NIC) by providing network operators, governments, regulators and other stakeholders the information and evidence needed to strengthen the Internet ecosystem at regional, continental and international levels. AFRINIC Labs conducts public-interest research on key areas such as Internet quality and performance, security, cloud computing and Internet access and is actively engaging with Internet standard bodies (for e.g. IETF, W3C, etc) to keep abreast of the latest technological changes and innovation. It is actively collaborating with regional and international research and academic institutions to conduct both scientific and policy-oriented research on the evolution of the African Internet ecosystem. AFRINIC Labs will contribute to gathering up-to-date Internet-related datasets through measurements and other sources and will establish a repository of information to further promote research, innovation as well as informed policy formulation. 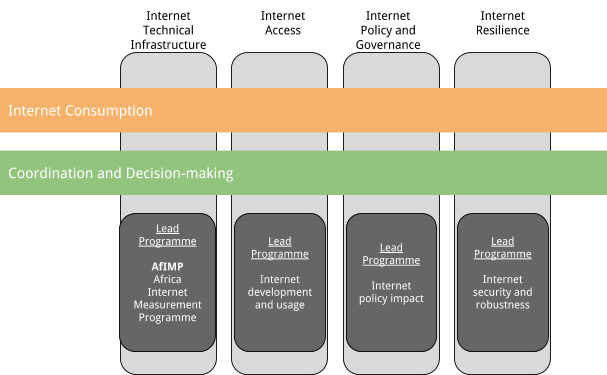 AFRINIC identified four main areas of research, which include Internet Technical Infrastructure, Internet Access, Internet Policy and Governance, and Internet Resilience. For each of the four core research areas, one lead programme or project is designed to shape the profile of an area and further research initiatives are developed through this programme. As shown in the figure below, Internet Consumption, as well as Coordination and Decision-Making, are two overarching research themes that are relevant to all the four research areas highlighted. These two research themes not only overlap and link the various research projects together but they also stimulate interdisciplinary research that contributes to the strength of the AFRINIC research capabilities. The research themes also form the important building blocks for the evolving profile of AFRINIC research within the emerging global network of Internet research institutes. As our research programme evolves, we expect to develop more cross-cutting topics and concepts in the field of Internet research. The central theme to the research agenda will be to increase and improve Africa’s access to the Internet through evidence-based policy advocacy and Internet regulation. Better interconnectivity within Africa should encourage creation, sharing and consumption of locally produced content. Improved access should mean that rural and poorer communities also enjoy high quality and affordable Internet access that allows access to local as well as global contents. The Internet, as an ecosystem made up of a wide variety of participants some with conflicting agendas, needs proper coordination to ensure that the African Internet continues to develop in a manner that is fair and sustainable for the benefit of all the stakeholders involved. While the Internet governance forums focus on community participation in Internet policy formulation, AFRINIC is in a good position to coordinate technical decisions and participation of all Internet providers in bringing needed improvements to the continent and the global Internet. It is important for AFRINIC to expand its technical awareness and monitoring of the African Internet topology, and to help promote evidence-based technical decisions among Africa’s Internet players. This research work is motivated by the need to improve the Internet interconnectivity in Africa and contribute to the Internet community's awareness of the logical and physical topology of African Internet. The African Internet is characterised by a low degree of interconnectivity among Internet service providers (ISPs) and between countries and regions. As a result, African countries have to exchange Internet traffic through global links in Europe, North America and Asia. The research aims to contribute towards a better understanding of the African Internet topology by publishing up to date topology maps and performance data. Topology data will be collected through network discovery techniques (active and passive network measurements), as well as mapping techniques, such as the use of geolocation databases. More specifically, this research aims to provide the Internet community with a router, a Point of Presence (PoP), and an AS levels Internet topology maps. Performance data will focus on the Quality of Service within and between different regions of the continent. For example, latency data (clustered at ASes, country and region levels) obtained from active monitoring of Internet links will be made available to the Internet community through an AFRINIC portal. The research further aims to provide public information pertaining to the distribution and utilisation of Internet resources in Africa, such as IPv6 enabled routers, active IPv6 prefixes and link capacities, among other information. The lead programme in this area, AfIMP (Africa Internet Measurement Programme), is geared towards understanding the state of Internet measurement in Africa with the aim of providing a holistic view of the area. It is common knowledge that there is a significant digital gap in terms of Internet availability and quality between different regions of Africa, as well as within countries of the continent. Whereas significant investments in broadband and mobile Internet has allowed many more urban dwellers to enjoy high-quality Internet connectivity, rural communities have remained largely unconnected. Research into 'Internet development and usage' will focus on highlighting the Internet disparities between the urban/rich and rural/poorer societies in terms of access (eg mapping zone/regions [not] connected via broadband), in terms of quality of service (which zones have better connectivity and which zones have sub-optimal connectivity, etc), among other considerations. This research will provide vital information to both the public and the private sectors about the regions and places where the focus of providing/improving Internet connectivity should be shifted to. The research is also vital for organisations/individuals advocating for equitable distribution of Internet resources. Furthermore, AFRINIC needs to highlight emerging technologies and protocols that are bound to significantly impact the way the Internet functions in the future. Some of the emerging technologies will include Internet of Things (IoT), Software Defined Networks, and IPv6. This research will contribute to a better understanding of the potential impact of these technologies on the African Internet. A special focus will be given to studying how these technologies could impact the state of the Internet in under-developed areas. It is of no doubt that regulations and policies whether national, regional or international impact the way in which a market behaves and Internet provision in Africa is not immune to this market forces. Africa is an emerging market but which is still highly regulated at the national and regional level. The policy-oriented research will help decision makers to make informed decisions on how to regulate the Internet. This research area aims to analyse how Internet policies (AFRINIC policies and country level policies) impact and/or affect Internet growth and performance in Africa. The work will bring together policy makers, engineers, regulators, research bodies and the private sector to engage them in the sustainable policy development process. Example of Internet-related policy research could be in the areas of Internet resources management, cross-border interconnectivity regulations, Internet pricing, cybersecurity, local content production, adoption of best practices and Internet freedom and accessibility. AFRINIC must continue to influence the design and implementation of Internet security frameworks to make the Internet more secure and to uphold the protection against personal data theft of African Internet Users. We have the mandate to also inform our members and the community of the best practices they need to implement to prevent security incidents. The ubiquity of mobile phones undeniably enlarged the attack surface of malignant applications, making the Internet more vulnerable.